Micheal Cor. Remi, 2012. Found material, shipping tarp and enamel, 8 x 9 feet. WASHINGTON, DC.- In 1949, the Italian painter Lucio Fontana began taking a knife to his paintings, stabbing and slashing through the stretched canvas. Through this act of creative destruction, Fontana sought to free painting from the traditional limitation of its frame and symbolically opened it into the great beyond of universal space. In recognition of the fifty year anniversary of Fontanas premier in the United States, Contemporary Wing is presenting BEYOND THE FRAME, which juxtaposes Fontanas canvases with the work of three emerging artists, recent MICA graduates Micheal Cor, Toym Imao and Ali Miller, who also fashion objects that go over, behind and beyond the frame of traditional painting. The show is accompanied by a fully-illustrated catalog, with interpretive essays written by Mike Maizels, a doctoral candidate in the History of Art at the University of Virginia and a predoctoral fellow at the Smithsonian Institution. While Fontana opened painting to the transcendent space of the universe, Micheal Cor seeks to enlarge painting to embrace the discarded remains of industry and culture. Ali Millers paintings break loose of their frames as the psychic barriers between subject, object and fantasy begin to unravel and Toym Imao uses his canvases as artifacts waiting to receive the force of his exploding effigy-monuments. In the work of these artists, the threshold between painting and sculpture serves as a framework for investigating the relationship between material and place, idea and object, history and potential. Lucio Fontana is one of the most significant artists of the 20th century. 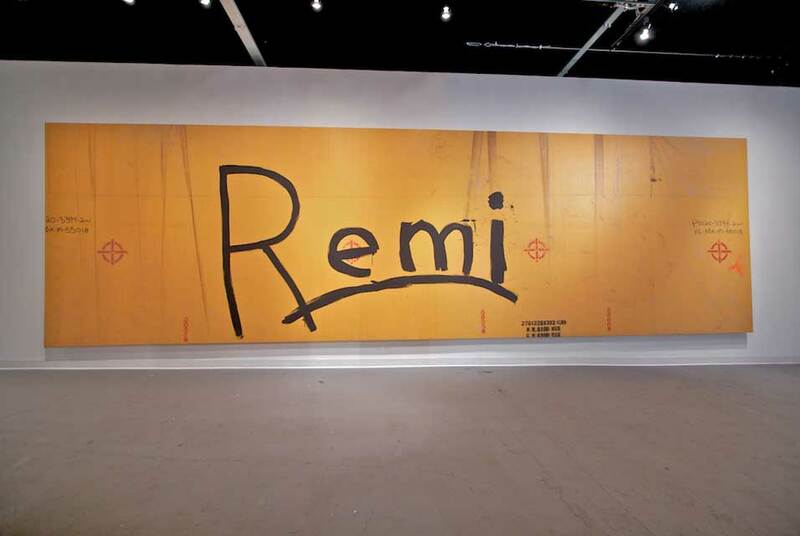 His signature knife-slashed canvases were first shown in the United States in 1961 and quickly became some of the most iconic works of the middle 20th century. His work is represented in dozens of major museums in the US and Europe. Working as a mechanic in the strip mines north of Edmonton, Micheal Cor developed a profound appreciation for materials redolent of crumbling history. Cor's sense of the poetry behind decaying materials deepened after his relocation to Baltimore, where he discovered troves of sloughed off industrial, architectural and personal material that could be easily repurposed into spare and powerful works. His works have been exhibited at numerous venues in the US and Canada, and is represented in several private collections. Toym Imao was forced to grapple directly with the historical constraints of his sculpture and the last in a long line of monument carvers. As a Fulbright Fellow studying in the US, he began to explore ways of subverting, undermining and deflating the orthodoxies of monument sculpture. Imao has developed a series of works he refers to as ASAPs or Auto Serendipitous Action Paintings. These exploding effigy works delivering force as soon as possibleliterally blow up the tradition of static sculpture. Imao's work is represented in numerous public collections in the Philippines and Vietnam. Ali Miller is a painter with a fastidious eye for detail and a hand for loose, flowing composition. Her provocative, dreamlike imagery is inspired by Freudian theories, neuroscientific discoveries and the contemporary mediascape. Her work is represented in the permanent collection of Alfred University and in private collections in New York.